Holston Mountain Beef Jerky is a small jerky manufacturer based out of Bluff City, TN, run by a guy named Gary Graybeal. Gary had been making jerky for several years, and shared it with his co-workers. His co-workers liked it so much, that Gary tried his hand at selling it. Holston Mountain has been in operation for the past six years now. Gary says he uses select Black Canyon Angus, using top inside round, and marinates it for 24 hours, then dries in dehydrators. Apparently, orders are coming in so fast, that he's never been able to test the shelf life on his jerky. His Hawaiian jerky, which I'll review later on, is apparently very popular that if you were to buy some it'll only be a few days old. Beef, worcestershire sauce, soy sauce, spices. The first thing I taste from the surface of these pieces is a saltiness, followed by a light blend of soy sauce and worcestershire. Overall, a moderate level flavor intensity. In the chewing, the first thing I taste is a stronger blend of worcestershire and soy sauce, with perhaps the worcestershire being more defined. 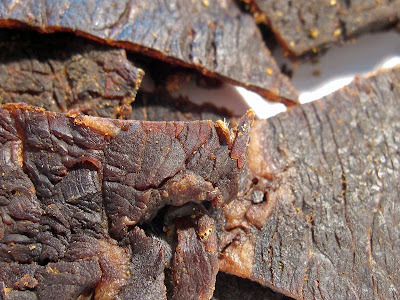 It seems the primary flavor of this jerky, from the surface flavors through the chewing, is the blend of soy sauce and worcestershire. The worcestershire seems to have a stronger definition, particularly in the chewing. The surface flavors seems to be a more even blend of the two. In general, I don't taste any of the natural meat flavors. But on some of the thicker pieces, I can register a faint meat flavor. The saltiness seems moderate in intensity. Aside from the soy sauce and worcestershire, I can taste the spices as well, but only lightly. I can't really recognize what they are, but I can see it on these pieces. I know black pepper is among them, because I found some black pepper bits, and bit one of them to make sure that's what it was. But the black pepper itself is not well noticed on this jerky. Overall, what you're going to taste in this jerky is the marinade, a blend of soy sauce and worcestershire, with the worcestershire having more definition than the soy sauce. These are slices of whole meat, sliced thin to medium, and in small pieces. This is a dry jerky, but has a soft feel. Tearing a piece apart with my fingers is easy, with a few pieces requiring a tad bit of effort. Chewing is varies from easy to somewhat easy. The chewing texture starts out feeling dry, and leathery in some and woody in others. But they're not hard at all. With some sucking and light biting, they seem to break down easily enough. Once it gets down to a soft mass, it feels very steak-like, similar to one cooked well-done. The chewing, however, does reveal several pieces containing unchewable wads of tissue. Perhaps it's a lot of membranous tissue, or chewy sinews, I'm not sure. Some pieces didn't contain any. There's also several pieces with significant streaks of fat. I also found a handful of pieces with gristle, some of which was significant enough to provide a chewing similar to a rubber band. In terms of clean eating, it's very much. My fingers didn't pick up any residue, and because these pieces don't require tearing apart, there are no fragments flying off. Holston Mountain sells this original variety from its website at a price of $6.00 for a 4oz package. I bought two packages, each a different variety. Add to that shipping costs of $4.20, and it brings a total of $16.20. That works out to a price of $2.03 per ounce. 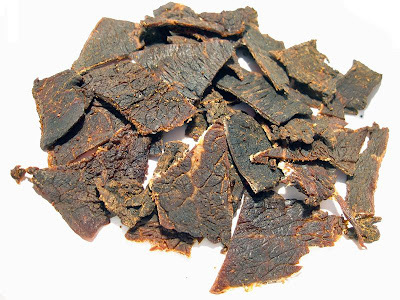 For general jerky snacking purposes, at the $2.03 price per ounce, this jerky provides a weak value. I'm getting only a small amount of snackability from this, largely because I see the flavor as being rather simple, and while the chewing texture is filled with unchewable wads of tissue, and gristle. The $2.03 price per ounce is on the higher end, though you can drive that price down with higher quantities, and perhaps get the snack value up to "fair". 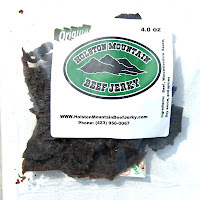 This Original variety from Holston Mountain Beef Jerky provides plenty of flavor, and steak-like chewing texture, but that flavor is largely limited to a soy sauce and worcestershire sauce blend. There's very little else to taste. I flirted with giving this a lower "fair" rating due to the low level of snackability I got from this, but since good jerky is also about the meat consistency and chewing texture, I opted to bump it up to "average". I think it does offer an ease in eating with its relatively easy chew, its bite sized pieces, and steak-like chewing texture. Though the presence of gristle and other unchewable wads of tissue tend to keep those positives in check. This jerky has some strengths and weaknesses, and overall, in comparison to other jerky brands I've reviewed, large and small, it seems to sit in the middle of the pack. My recommended beer pairing for this, try a smoky porter.